Two VR games, tons of mayhem. 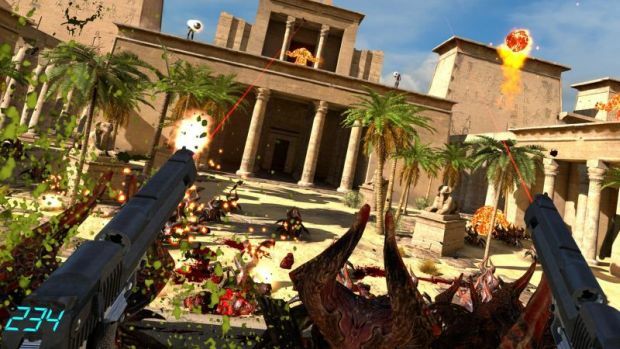 Croteam has announced that Serious Sam VR: The First Encounter and Serious Sam VR: The Second Encounter are now available on Steam for HTC Vive and Oculus Rift. You can pick up both games at 25 percent off. Like the base games, Serious Sam VR will feature hordes of enemies of dispose of and tons of different weapons like the Sniper Rifle, Shotgun, Chainsaw, Minigun and more to do so. The games take place in ancient Egypt, medieval Europe, South America and other exotic locations. Campaign levels are multi-level and it’s possible to play with up to 15 friends in co-op. Alternatively, you can battle in competitive matches like Beast Hunt, where you compete in a hunt and My Burden, which sees you holding an item to boost your score. Capture the Flag and Instant Kill are also available and it’s possible for normal players to compete against VR players. Thoughts on both games? Let us know below.